Xi’s visit to Xinjiang reveals a focus on counterterrorism and continued economic development. Chinese President Xi Jinping arrived in Xinjiang on April 27 to inspect the situation in the special administrative region. His trip was extensively covered by China’s state media, although the coverage appeared only on the Chinese-language version of Xinhua’s website. According to Xinhua, it was Xi’s first visit to the far-western province since the 18th National Party Congress, where Xi was officially named the top leader of the Communist Party of China (CPC). The major goal of Xi’s trip was said to be “deeply implement the spirit of the Third Plenum,” which placed a heavy emphasis on reforms. While in Xinjiang, Xi visited military and paramilitary outposts in Kashgar, where much of the recent violence in Xinjiang has been centered. Xi praised the army for embodying the concept of many ethnicities uniting to form one family. However, in a nod to the complex situation in Xinjiang, Xi also offered encouragement to the troops. “The more complex and severe the environment, the more able we are to sharpen our willpower and skill,” he said, urging the Xinjiang troops to reach new achievements for their homeland and the people. On Monday, Xi observed counterterrorism and riot control drills in Kashgar. Afterwards, he called Kashgar the “front line” for counterterrorism and stability preservation. Local police stations will play a special role in this effort — Xi called them “fists and daggers.” Xi exhorted police forces in Xinjiang to follow the example of Qi Jiguang, a 16th century Chinese general famous for successfully battling Japanese pirates. Xi was particularly interested in Qi Jiguang’s success with training and equipping a local army, hinting that Xi may want to see more local Xinjiangese taking a role in security operations. However, in addition to a military focus, Xi also emphasized the need for a better quality of life in Xinjiang. 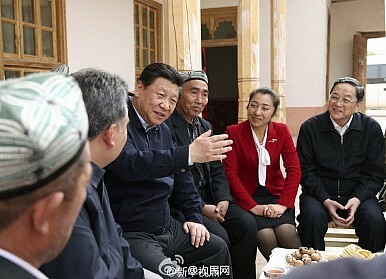 Xi visited a Uyghur ethnic village, and heard high praise for the Party’s policies. In response, Xi said that “policies must revolve around popular will and be formulated for the benefit of the people.” He especially emphasized the role of economic development in the region, telling local leaders that construction projects and new industries must provide employment and increased income for the local people, “no matter who is investing” in the projects. When discussing both security and the economy, Xi’s major theme was the concept of China as one family containing many ethnic groups. “We must push forward ethnic unity and finish the construction of Xinjiang,” Xi said after watching a traditional musical performance. As part of this, he encouraged students at a local elementary school to be bilingual, speaking both the Uyghur language and standard Mandarin Chinese. Teaching ethnic minority children to speak Mandarin, Xi said, will “not only make it easier [for the students] to find jobs in the future, more importantly, it will make a huge contribution to pushing forward ethnic unity.” However, he also encouraged the Mandarin teachers to study the Uyghur language so as to better communicate with their students. On one hand, Xi’s tour of Xinjiang was a typical propaganda campaign, designed to highlight Xi’s concern for and conversations with the common people at each of his stops. Most of the coverage, complete with picture, was initially reported on Xinhua’s official Weibo microblog and then reposted by China’s other media outlets. The tour, then, can be seen as more evidence of Xi’s desire to brand himself as a friend to the ‘common man’ — a strategy Western leaders have long since perfected. After another, even deadlier, terrorist attack in Urumqi, Beijing must reevaluate its anti-terrorism strategy.